"Language is the source of misunderstandings" written by Antoine de St. Exupery sums it up. Odd for someone who labels himself "wordsmith and artchivist" to be so negative about words. The photo above proves my point a little - I saw it in Amsterdam, in Dutch in says "translation from one language to another", on the other side of the bronze it says in Arabic "translation from one language to another". If ever there was a smart prank, then this was it. The pompousness of the endeavor, bronze etching and all that, only adds to the joke. 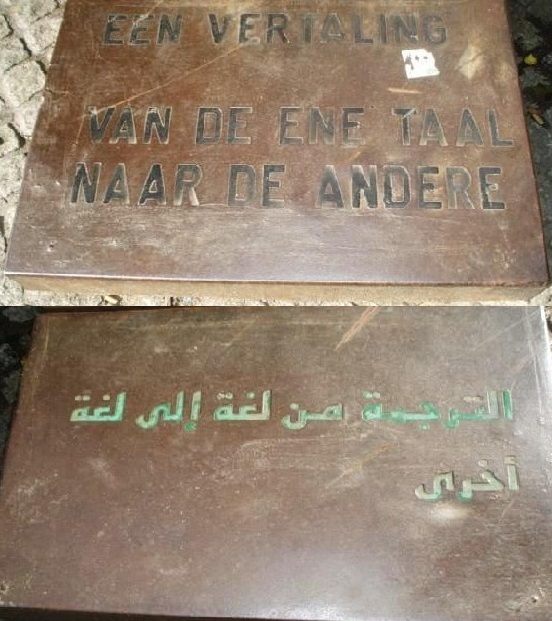 After all, both sides of the plaque are perfectly translated, but in reality they say nothing. Or worse, they say something which is so technical it ends up as a vicious circle. It talks about the act of translating not about the content of it. I see this happening frequently, specifically with students, they say something so totally incomprehensible, and then follow it up with the Lebanese idiom "ye3ne" (which translates roughly into "in other words" or French "c'est a dire") regardless of the language in which they were doing their presentation, and then add another "clarifying" sentence which makes even less sense than the first one still does not get their idea across. Before you think I am impartial to badly structured sentences, let me remind you of Valentina Hasan, the woman who auditioned to the Bulgarian "Music Idol" show with "Ken Lee" - her take on "Without you" (famed by Mariah Carey although originally for Badfinger). Hasan butchered the song - with "ken lee" being her phonetic take on "can't leave" from the song's chorus which we all attempted under the shower I am sure. But what made Valentina Hasan become an internet sensation as opposed to being just part of a video entitled "worst_singerz_eva" (eva is how the youth spell ever) is because - once you strip the outside antics - the inside message was clear. Even Mariah Carey who saw Hasan's video on a French TV show basically congratulated her for her "chutzpah". Hasan was not the first person to shoot to internet fame because of a bad audition, William Hung did that too with his version of Ricky Martin's "She Bang" - part of the original charm of Hung was that he was singing flatly with no rhythm (although there was no English deformations as with Hasan) but his stardom faded when he started "rehearsing" for his shows when obviously the audiences wanted the "nerdy" version he was famed for. This was the case of someone improving the content when people did not want him to. Hung was the anti-thesis of Hasan, she kept more of less hanging to her daftness (even if subsequent versions showed a mildly improved English) knowing it was her core message she was known and loved for. This holiday season I have witnessed a marvelous feat, my niece came from the US - she is 7 - and played with my two nephews aged 10 and 5 respectively. I am not even sure if the three kids had any solid language between them since they seemed to be fluent in different ones independently. The level of non-language dependent interactivity, which included games, laughter, fights, make ups, fights again, rules, regulations, and whatnot was amazing. They were able to have all the sweet memories kids tend to have at their age even if honestly I still cannot comprehend how they managed to understand each other on such a visceral level. And speaking of marble plaques like that one in Amsterdam, I am reminded of one of the most interesting artworks I have come across by Braco Dimitrijevic "This Could Be a Place of Historical Importance"which was a plaque that could be put anywhere, full of suggestion, playfulness, seriousness, and at the same time says very little. The message itself is the chief driver of the work, making the words ring in beauty wherever placed and giving the suggestion of "historical importance" to any geographical location. But all this brings me back to St. Exupery, perhaps sometimes we undertake such an effort to make ourselves understood through the technicality, and we get lost in translation, whereas if we focused on the message itself, am sure we would be heard loud and clear.